Domino's pizza is one of the Indian's favorite pizza destination. Today is Friday and it is time to avail Dominos Buy 1 Get 1 Free Pizza offer. Pay for 1 pizza and get 2 pizzas for 1 pizza amount. The offer is applicable on all Dominos stores located in different locations including Chennai, Mumbai, Delhi, Bangalore, Kolkata, Hyderabad etc. 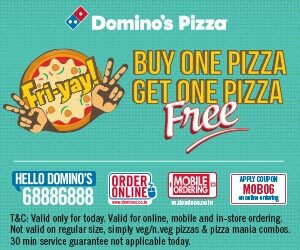 How to avail Dominos India Buy 1 Get 1 Free coupon offer? 3. MOB06 has to be used as Dominos coupon Buy One Get One Free offer coupon code. Apply coupon code 'MOB06' before making payment. Enjoy Dominos Pizza Buy 1 Get 1 Free Offer. 2. Valid only for today. 3. Valid on online, Mobile App and in-store ordering. 4. The offer is not applicable on regular size, simply veg, simply non veg pizza, pizza mania combos. 5. 30 minute service guarantee not applicable today.